Decorate your home or office this holiday season with fresh Balsam or Fraser wreaths some mixed with cedar or white pine fresh from Wisconsin. White Pine wreaths on request. Our Balsam & Fraser fir Christmas wreaths and kissing balls are exquisitely handcrafted of fresh cut Balsam or Fraser fir. These beautiful holiday decorations fill the air with the clean, sweetly fragrant, colorful decoration for your front door. The scent of real fresh-cut balsam or Fraser from Wisconsin cannot ﻿be matched. Each Wreath comes decorated with a bounty of perfect pine cones and bright decorations, topped with a festive and weatherproof red velveteen ribbon. If you prefer, visit our farm and choose from a wide variety of ribbon, cones, and decorations. 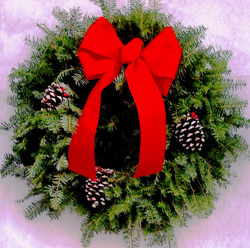 All of our wreaths are hand-made right here on our farm with fragrant evergreens. Want more than just a gift idea for a final remembrance of Christmas past, first Christmas or his or her own, birthday, wedding, or anniversary, what about one that says, job well done? Why not send a certificate for a tree, wreath, or kissing ball. Better yet, simply choose an ﻿amount and ﻿let your special person(s), chose for themselves just the right something. It is precisely the right way to remind them, you desire to give them more than a just gift, but also an unforgettable experience. Imagine, them walking through acres of trees, and finding THE tree, or selecting that wreath, the one that says WELCOME. Perhaps it a kissing ball for their first home or apartment. Do you need a gift for an employee? Choose one that will warm their hearts and give the whole family a joyous adventure. Our wreaths are handcrafted and may vary slightly in size. Choose a colorful holiday kissing ball for decoration--all hand-made with fragrant Balsam, Fraser or mixed evergreens. Those concerned by the poisonous nature of Mistletoe first used kissing Balls in place of Mistletoe. Our designer at Bentz Road Farm has developed the Kissing Ball into the next dimension. The Kissing Ball has taken on a place of its own. We make Kissing Balls in several sizes to accommodate every delightful nook you have. Be it the corners of your home, front of your garage, perhaps your porch, or on a Sheppard's hook your home will not be bare in winter any longer. Replace your summer hanging baskets with a lovely, brightly decorated, fragrant, Kissing Balls and catch that special person under one in your home!